Unless otherwise shown, the quotations are from Peanuts, put in the mouth of characters there by Charles M. Schulz. Schulz comments on Peanuts are also here. "Have you ever been on a cruise ship? Passengers open up these canvas deck chairs so they can sit in the sun. . . On the cruise ship of life, Charlie Brown, which way is your deck chair facing?" "I've never been able to get one unfolded." Linus: "Nothing goes on forever. All good things must come to an end . . ."
Linus: "What's wrong, Charlie Brown?" Charlie Brown: "I just got terrible news. The teacher says we're going on a field trip to an art museum; and I have to get an A on my report or I'll fail the whole course. Why do we have to have all this pressure about grades, Linus?" Linus: Well, I think that the purpose of going to school is to get good grades so then you can go on to high school; and the purpose is to study hard so you can get good grades so you can go to college; and the purpose of going to college is so you can get good grades so you can go on to graduate school; and the purpose of that is to work hard and get good grades so we can get a job and be successful so that we can get married and have kids so we can send them to grammar school to get good grades so they can go to high school to get good grades so they can go to college and work hard . . ."
"Look out!! Ha! Now you've done it! Now you've broken a lamp, and you've got no one to blame it on but yourself!" Only in math can you buy sixty cantaloupes and no one asks what . . . is wrong with you. "Some day, we will all die, Snoopy." The dog we see running frantically down the road pursuing the family car . . . is not really being left behind, . . . but . . . It is no wonder that we make terrible choices in our lives to avoid loneliness." - Charles M. Schulz, You Don't Look 35, Charlie Brown! "The worst part of it is you don't know if he's barking at an owl, the moon or a burglar!" "You mean you're going to send the same form letter to the Great Pumpkin, Santa Claus and the Easter Bunny?" Years are like candy bars . . . We're paying more, but they're getting shorter. "Schulz moved . . . in an artistic direction that was minimalist in style but richly suggestive in content." - M. Thomas Inge, in Schulz 2010:x. The Norwegian-American cartoonist Charles Monroe Schulz (1922-2000) was born in Minneapolis, Minnesota, and loved drawing. A bright boy, he skipped two half-grades in elementary school. However, as the youngest in his class at Central High School, he became shy and timid. He was drafted into the United States Army in 1943, After leaving the army in 1945, he returned to Minneapolis where he took a job as an art teacher at Art Instruction, Inc.
Schulz' first regular cartoons, Li'l Folks, were published from 1947 to 1950. In 1950 Schulz approached the United Feature Syndicate with his best strips from Li'l Folks, and Peanuts first appeared late that year. The strip became one of the most popular comic strips of all time. It ran for nearly fifty years without interruption and appeared in more than 2,600 newspapers in seventy-five countries - that makes for a quite global reach. Schulz drew much of the inspiration for the strip from his own life. He single-handedly designed, researched, wrote, and drew every Peanuts panel and strip that appear in daily and Sunday newspapers around the world. The artist dared to use his own quirks –a lifelong sense of alienation, insecurity and inferiority –to draw the real feelings of his life and time. Charles Schulz gave vent to keen observations on life and culture in the United States through his strips: Philosophy, ethics, and cultural history come into play. With a sharp sense of humor and a keen understanding of alienation, he made 'Peanuts' a cultural touchstone. Isolation runs very deep in Schulz and in his characters throughout the series . Schulz knew the value of varying a few basic themes, and he said things clearly. His strips are teeming with neat, existential statements; they are comic strip koans about the human condition. His characters often speaks "in two different keys.", . . . novelist and semiotics professor Umberto Eco has noted. By fusing adult ideas with a world of small children, Schulz reminded us that although childhood wounds remain fresh, we have the power as adults to heal ourselves with humor. "The greater the art, the more indirective it will be"
The real world is one of perceptions that are translated into images deep inside oneself. Decisions of great makings may need major deceptions to decipher too, as in great art. "The greater the art, the more indirective it will be". Real decisions are as great as art, if not greater, eventually. Feel free to try to make your opportunities concur with the opportunities of people whose incomes are ten times greater than yours [Cf Edward S. Martin]. Many facts of life can make you burst into tears. Much depends on how you go on from there, and your friends. Most often it's like this: The greater income, the greater oppportunities. You must grieve - it is natural - if you suddenly find you depend on friends with greater income and greater opportunities than yourself. "You're crazy!" Charlie Brown tells (Linus). "All right, " replies Linus, "so you believe in Santa Claus, and I'll believe in the 'Great Pumpkin'". Furthermore, the "great Pumpkin" will only appear in "the pumpkin patch that he thinks is the most sincere." "The Church, rather than always being annoyed by the arts, should encourage a vanguard of men and women to be interpreters of these tongues, or arts." [Short 17Q] Historically . . . the Church has been impatient with the arts, just as many of Christ's detractors were impatient with his parables and indirectness: "How long will you keep us in suspense? If you are the Christ, tell us plainly" (John 10:24). You may also wish to know why something to believe in first has to be told about before it is up to frantically sought, not why stars and strengthening ideals without solid foundation under them, must shine. The most sincere expressivity hardly judges before the time is ripe. The society must depend on what is called respectable ones or respectability - it's mostly had by mere habit. Dance the (figurative) security blankets away if you manage to do so. In a sincere society people tend to be fond of dancing. Expressivity is something managed for most part. Be an artist to give your family a respectable life and give millions to charities if you can. For a time in the 1950s Charles M. Schulz (November 26, 1922 - February 12, 2000) was called the "youngest existentialist". And before that, before he was a one-week old infant born to Carl and Dena Schulz of St. Paul, Minnesota, an uncle nicknamed him Sparky after a horse the uncle was fond of. In Kindergarten a teacher told him, "Someday, Charles, you're going to be an artist." Schulz later recalled he thought he was born to draw comic strips. "I think I was." The earliest ambition he could remember was "to produce a daily comic strip". Late in life he repeated it, "My main job is to draw funny comic strips for the newspapers." He didn't set himself up as a philosopher or therapist to the millions. He made no statements about important issues. He sat on no commissions. Using a Crow-quill pen dipped in ink, Schulz drew every day through the next three decades. He always worked alone, without a team of assistants. The strip cartoon was an ideal form for him: The strip cartoonist can get up, go to work, draw his daily panels, and go to bed at night feeling he's done his bit. Edgy, unpredictable, ahead of its time, "Peanuts" "vibrated with '50s alienation" - Trudeau. Success fell off Schulz. He was unable to take refuge in its rewards. With his first wife and five children, he moved in 1958 to a paradise among the redwoods of Northern California, where he briefly found happiness. As American soldiers stenciled Snoopy onto their helmets and the Apollo 10 astronauts christened their command module Charlie Brown and their lunar landing vehicle Snoopy, Schulz left his imprimatur on the Cold War's highest and lowest moments. "Peanuts" became a refuge. Schulz became the patron saint of people who were putting up with all they could take. As a young man he had suffered deep loss. Three days after his mother's early death from colon cancer, he boarded a train for Camp Campbell, Kentucky, and the war in Europe. The sense of shock and separation never left him. Nor did the Scandinavian part of Schulz's character - a quality that took part in making him very different from any other comic strip artist. Schulz also possessed a strong independent streak against life's injustices - they were piled up and at last found artistic expression in his most interesting characters: the long-suffering Charlie Brown, exuberant Snoopy, philosophical Linus, domineering Lucy, talented Schroeder, narcoleptic Peppermint Patty, became revered figures in Japan, beloved in England, France, Germany, Norway, Italy, and known by sight in 75 countries throughout Europe, South America, Africa, Australia and Asia. At all levels of society "Peanuts" had a profound and lasting influence on the way people saw themselves and the world in the second half of the 20th century. He had few friends at school. In practically every thing he did at school, he felt underestimated by teachers, coaches and peers. No one ever gave him credit for his drawing, or for playing a superior game of golf. "It took me a long time to become a human being," he once said. He wanted only to exist in the extreme bottom right-hand corner of his own panels – where it said "Schulz." He wanted to limit himself to being that little scribble who had dropped having many illusions about what's really happening in people's lives. At his drawing table in Santa Rosa, he drew with the same old pens, the same old nibs. He liked to say that he would stay at the desk until he wore a hole clean through it. If he could draw his four panels a day, sign himself "Schulz," close up shop and go home, all would be well. But he married twice and raised five children. He dressed modestly in muted slacks and pastel golf sweaters. He liked to sprawl after work in an easy chair, his long legs pointing at the TV set. In his home and surroundings he was a smiling type, with straight white teeth and a head of silver hair. But the unprecedented obligations of his new role as world-famous cartoonist kept him in a state of anxiety and dread. He panicked on airplanes, broke out in a cold sweat at the very idea of a hotel lobby. He refused very many requests for public appearances and replied to mail instead. Also, he became the most widely syndicated and beloved cartoonist of all time, with huge success. He took little interest in accumulating money, gave millions away to charities, insisting always that he was the same old Charles Schulz. "Peanuts" was proof that you were not alone when you woke in the middle of the night marooned with your failures, staring into the dark, worrying that the world had gone mad. Charlie Brown reminded people, as no other cartoon character had, of what it was to be vulnerable, to be human. The Times of London called the Peanuts figures "international icons of good faith" – perhaps not surprising for a cartoonist with a Dickensian gift for characterization. Until 1965, Schulz set out consciously never to settle issues raised by the strip and never to bring in issues from outside. Having established an idiom and a mode that commented on modern ills such as commercialization, real estate development, generational distrust, Schulz extended the area of doubt in modern life only insofar as he made it funny to doubt. Basically, he had sustained the traumas of his adolescence far into adulthood – far enough, in the end, to see them become a crucial element in the universal popularity of his art. He dreaded becoming a prisoner of success, perhaps because it meant he would lose control. He wanted to be free and hated to talk about his enormous success. How popular was it? An example: In December, 1969, when Schulz was 47 years old, more than half the nation's television audience tuned in to the fourth airing of the Emmy award–winning animated television special, "A Charlie Brown Christmas". It's popularity confounded network executives. "That same night, a musical, "You're A Good Man, Charlie Brown," was playing to sold-out houses in its second season on Broadway; and a feature-length animated film, "A Boy Named Charlie Brown," was setting attendance records at Radio City Music Hall; every few hours, 6,000 more parents and children would form a vast line outside the "showplace of the nation." More than 150 million readers were following the daily and Sunday "Peanuts" strips, while in bookstores "Peanuts" collections swamped the best-seller lists, eventually selling more than 300 million copies in 26 languages." This was not awfully bad for someone who had survived the Depression and World War II, the alienation of his youth, and for a time had had no hope for the future. And who later, as part of his morning routine, had an English muffin with grape jelly and drank coffee from a Styrofoam cup, then sat down to his drawing table and the long, white Strathmore board with the five-inch-by-five-inch panels in which he drew the daily strip. Garry Trudeau, creator of "Doonesbury," thought of it as "the first Beat strip." Melancholy would dog Schulz all his life, as would feelings of worthlessness, panic, and frustration. A shy, timid boy, a barber's son, rose from modest beginnings to realize his earliest dream of creating a newspaper comic strip. This he did for nearly 50 years. From 1965 onward, the strip and its characters had gone from being a campus phenomenon in the late 1950s to a mainstream cultural powerhouse. Schulz took much pride in the achievements of the strip, and at the same time struggled to believe that he was worthy of the respect and love his admirers showered on him. "I just did the best I could," he said. What was it? As part of his morning routine, he ate an English muffin with grape jelly and drank coffee from a Styrofoam cup, then sat down to his drawing table and the long, white Strathmore board with the five-inch-by-five-inch panels in which he drew the daily strip. And then, what Schulz had achieved with pencils and paper, turned into a worldwide industry. "Peanuts" captured and began to dominate new markets in stage, television, film, book, record and subsidiary forms. "Peanuts" was expanding an industry that would revolutionize worldwide entertainment into the our century. For the first time in the book trade, booksellers of the late 1960s, started to sell not just "Peanuts" books but also sweatshirts, dolls and an increasing array of paraphernalia that bore the image and form of the characters in the books. Peanuts licencing brought in $1 billion a year to United Features and made Schulz richer than any popular artist in the world. He influenced two generations of comic strip artists, standup comedians and readers in many countries. Unlike other seminal figures of American mass culture in the 1960s and '70s – Marshall McLuhan, Buckminster Fuller, Andy Warhol – Schulz was not inclined to be a teacher, a guru, a manufacturer of lesser artists. "I don't know the meaning of life," he once said. "I don't know why we are here. I think life is full of anxieties and fears and tears . . . and it can be very grim." 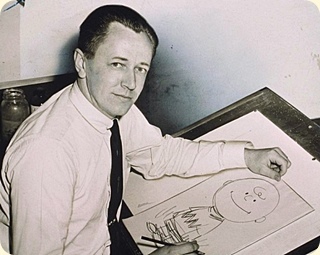 The experience of being an Everyman – a decent, caring person in a hostile world – was essential to Charlie Brown's character, as it was to Charles Schulz's. Chronic rejection and unrequited love are the twin pligths of Schulz's early life and later work. He said with conviction, "My whole life has been one of rejection." He had became the highest paid, most widely read cartoonist ever and a class all by himself. At the peak of Schulz's popularity, "Peanuts" captured 355 million readers, and he was earning from $30 to $40 million a year. What is more, throughout the '60s and early '70s, the visual and verbal vocabulary of the strip was one of the only languages that kept both the younger and older generation fluent with each other. From modest beginnings, extend your personal doubts and insecurity into universally popular, extremely welcome art, based on regular, daily routines in a well ordered personal life. The art of Peanuts has helped persons talking with one another and expressing differently than they otherwise might be able to. A well ordered artist may still look different - since artists tend to differ from Average Joes and ordinary Joes, Joe Sixpacks, Joe Lunchbuckets, ordinary Janes, and average Janes too. Many seek to appear respectable, but that is probably not enough, so respectable-looking Average Joes may find themselves trying to look different through new styles of clothes, new hair-do's, looks, and further - in other words, through more or less conformity-based padding. It might in time mask hidden insecurities so that their own expressivity and the refining of it flounders. The book comes with a chronology, and dives into topics and characters from their creator's point of view. Short, Robert. The Gospel According to Peanuts. London: Fontana, 1966.